For almost four decades, I have worked with hundreds of businesses, both before and after a hurricane has hit. Unfortunately, I have found that most businesses have a poor understanding of hurricane wind structure and movement, potential storm surge, and forecast accuracy. 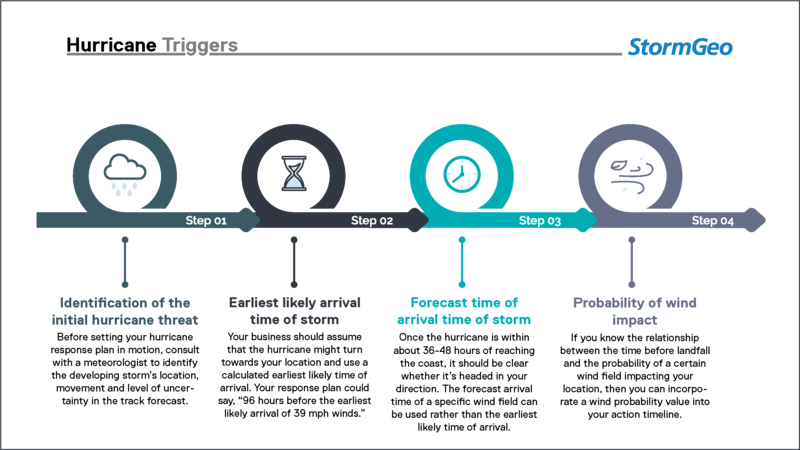 In addition, the action timelines of many companies are based on hurricane misconceptions. With the devastation of the 2018 hurricane season still fresh in our minds, now is a good time to educate yourself on the correct time to react (based on sound meteorological data) if your business is faced with a hurricane threat. Many companies use a phased plan of action. For example, a facility might decide to take a specific action 96 hours before the hurricane arrives. But because all the steps of a phased response plan are based on the arrival time of the hurricane, it’s critical that what is meant by "arrival" is properly defined. Let’s discuss each of these three criteria further to see why basing decisions for action on any one of them is unwise. Some companies still use range rings to trigger their hurricane response plan. Range rings are concentric circles displayed on a map, spreading outward from a specific location at distances such as 10 , 25 or 50 miles. Range rings make it easy to visually estimate the distance from a company’s location to the eye of the hurricane. However, just because a hurricane is predicted to pass within “x” miles of a company’s location does not mean that the hurricane is a significant threat to that location. In addition, knowing that the storm is predicted to pass “x” miles away does not provide enough information to make an informed decision about a potential impact timeline. For example, Hurricane Florence was originally forecast to only affect Bermuda. In two days, the storm drastically changed course and headed straight for the US East Coast. In this case, range rings would have failed to provide adequate time for companies to prepare as well as a realistic expectation of the impact timeline. Hurricane-force winds often cover only a very small area with respect to the hurricane’s total wind field. Consider that typical forecast error three or four days before landfall may equate to several times the diameter of hurricane force winds. Triggering a significant action from a hurricane response plan upon a predicted impact of hurricane force winds does not take into account forecast uncertainty. It is best to use a probabilistic approach (looking at the likelihood that an event will occur) for such triggers, incorporating a probability of wind impact into a hurricane response plan. Many hurricane response plans base an evacuation decision or other significant actions on a hurricane’s predicted Saffir-Simpson category. For example, a response plan may require an evacuation of the facility only for a hurricane that reaches a Saffir-Simpson Category 3 or higher, leaving crews to ride out Category 1 and 2 hurricanes. However, the Saffir-Simpson classification is only a wind scale — it says nothing about potential storm surge inundation. In some cases, a Category 1 hurricane could produce a greater storm surge than a Category 4 hurricane. It all depends on the size of the hurricane’s wind field. Maximum sustained winds (which determine the Saffir-Simpson category) may not actually have much impact on the storm surge. Additionally, there can be wind damage to structures and injuries from tropical storm-force wind, as well as flooding from tropical depressions and storms. These levels of storm type are not even considered a Category 1 on the Saffir-Simpson scale. Thus, if a company’s response plan “begins” at Category 1, it’s not as complete as it needs to be. So, what information should you rely on for your hurricane plan? Perhaps most important is to subscribe to a professional weather service that can provide you with accurate and timely weather information tailored to your specific location(s). This service will not only ensure you are their number one priority, no matter the time of day, but they will provide critical information that complements your response plan so that damage and injuries are mitigated and unnecessary actions are avoided. Instead of relying on a proximity trigger like range rings to set your hurricane response plan in motion, you should be consulting with a meteorologist who knows your business and concerns. This meteorologist can identify when you should consult with your professional weather service. These meteorologists will be familiar with your business and locations and can identify the best time to activate your hurricane response plan, based on a developing storm’s location, movement and level of uncertainty in the track forecast. Instead of expecting a given forecast to be perfect, your business should assume that the hurricane might turn towards your location or arrive earlier than anticipated. Your professional weather team can calculate the possibilities of various arrival times so that critical decisions can be made without wasting precious time. Your plan could then be modified to say “96 hours before the earliest likely arrival of 39 mph winds.” This is much clearer and allows you to take action even when the hurricane is not initially forecast to impact your area. This calculation could be made by the layman, but there are so many variables involved that it would be best left to a trained meteorologist. Once the hurricane is within about 36-48 hours of reaching the coast, forecasts are likely to be accurate enough to know with some certainty that the hurricane is or is not heading towards your location. Taking this into consideration, the next steps of your hurricane response plan can be moved to with confidence. Not every forecast is perfect and there is always a certain amount of uncertainty, therefore it is important to know the forecasted wind speed as well as the likelihood that your location will experience those winds. Taking into account a typical forecast track error and wind field size, a probability of wind impact can be calculated for your location. If you know the relationship between time before landfall and the probability of a certain wind field impacting your location, then you can incorporate a wind probability value into your action timeline. Thus, a timeline based on sound meteorological data would state: “96 hours before the earliest likely arrival time of 39 mph winds plus the probability of strong winds impacting your location is greater than “x” percent.” This takes into account forecast error, hurricane size, and the probability of it turning toward your location. For more information about how to develop the recovery phase of your hurricane plan, read part two of this series. Previous insight: Will Machine Learning Make Us Rethink Chaos Theory?